Are you confused about the Status of a Case in the City Civil Court? This article explains what the case status means in the City Civil Court in Maharashtra. After hearing the arguments (oral submissions) from both the parties to the proceedings, Court is to fix the date for Judgement (Final Order). After recording of Evidence from both the parties, Court hears oral submission from both the sides in support of their respective stand. The process of hearing such oral submission is known as Argument. At the time of argument respective counsels for the parties put forth their submissions with citations to convince court on the issue in question. When the process of recording of evidence is initiated and matter adjourned for recording further evidence by giving next date, stage of such matter is notified as evidence (partly heard). When the evidence of the defence is to be secured, the state Evidence (Defence) is mentioned. In criminal matters instituted by other wise than police report, evidence is also recorded before issuance of process, the state Evidence Before Process is mentioned in such matters. Hearing includes recording of evidence or also hearing of arguments i.e. Oral submission by the parties. The criminal case is fixed for this purpose to record a statement of accused on the point of incriminating evidence collected against him during the course of trial. When notice is required to be issued to the party to proceeding at the middle stage of its progress/trial i.e. When matter is ready for effective hearing, state Notice (Ready) is given. When summons are required to be issued to the party to proceeding at the middle stage of its progress/trial i.e. When matter is ready for effective hearing, state Summons (Ready) is given. At this stage court prepares a document on the basis of which charges levelled against an accused are read over and explained to him and to which he either pleads guilty or claims a trial by denying the charges leveled against him. When matter becomes ready/effective to under take hearing, court use to fix date for hearing of the said matter. To facilitate hearing of the appeal (both civil and criminal), copies of relevant documents in the proceedings are prepared on depositing costs by the appellant or party requesting for the same. A bunch of such document is known as paper book. The work of preparation of paper book starts after the receipt of Recorded & Proceeding from trial Court and all respondents are appeared in the matter then file send to paper book section for preparation of paper book. When notice is required to be issued to the party to proceeding at the initial stage of its trial i.e. state notice (Unready ) is given. When summons are issued against party to the proceeding, matter is kept pending awaiting report of service of such summon. When Non bailable warrant is issued against accused in a case at the middle stage of the trial, i.e. When matter is ready/effective, this stage is given either for issuing such NBW or awaiting report of the same. When bailable warrant is issued against accused in a case at the middle stage of the trial, i.e. When matter is ready/effective, this stage is given either for issuing such BW or awaiting report of the same. When Non bailable warrant is issued against accused in a case at the initial stage of the trial, i.e. When matter is unready/ineffective, this stage is given either for issuing such NBW or awaiting report of the same. When bailable warrant is issued against accused in a case at the initial stage of the trial, i.e. When matter is unready/ineffective, this stage is given either for issuing such BW or awaiting report of the same. In every proceeding, parties file several documents. To curtail volume of evidence to be adduce, at this stage parties are called upon to either admit or deny the documents filed by other side. Excluding the admitted facts, issues are framed by the court. Parties are required to adduce evidence on the issues framed as per burden of proof. When record and proceedings of lower court is ordered to be called for, writ for the same is issued. Matter is posted awaiting Record and Proceedings of lower court.. When during the course of hearing of the matter record and proceedings from other court is called either suo moto by the court or on the request of parties,this stage is given to the proceedings either for calling such R&P or for awaiting the same. FILING OF V.P. (UNREADY):- When filing of vakil patra becomes necessary at the middle stage of the proceedings/trial, this stage is given. In proceedings after hearing both the sides several misc. applications are to be decided by passing orders. In addition to this several consequential orders on failure to appear, failure to comply with the directions issued by courts are to be passed. Stage order is therefore fixed in such matters. When order is to be passed on interim application, stage order on exhibit number of such misc. application is given. FILING OF VAKILPATRA:- Pl. refer explanation of stage shown at sr.no. 20 and 21 above. When party files misc. application seeking interim relief during the course of trial, court use to call say of other side. If at such stage matter is in ready state, this stage is known as Filing of say on Exh. (Ready). This entry was posted in City Civil Court, Code of Civil Procedure 1908 (CPC), Useful Information on March 7, 2015 by admin. What is the meaning of “Interlocutory Orders”? An Interlocutory Order (also known as an Interim Order) means the decision of the Court which does not deal with the finality of the case but settles subordinate issues relating to the main subject matter which maybe necessary to decide during the pendency of the case due to the time-sensitivity of those issues. An Interlocutory Order is given mainly to ensure that the interests of either party are not harmed due to and during the process of justice. (e) make such other interlocutory orders as may appear to the Court to be just and convenient. Schedule 1 of the C. P. C. (Various Orders and Rules) deals with the procedural aspect in greater detail. This entry was posted in City Civil Court, Code of Civil Procedure 1908 (CPC), Useful Information on December 11, 2014 by admin. A Vakalatnama is a document in writing, appointing a lawyer or pleader to represent the clients matter in a court of law. 4. (1) No pleader Shall act for any person in any Court unless he has been appointed for the purpose by such person by a document in writing signed by such person or by his recognized agent or by some other person duly authorized by or under a power-of-attorney to make such appointment. What is the meaning of VP or VP Filed in the Court proceedings and Roznama? VP means Vakil Patra, which is another name for Vakalatnama. 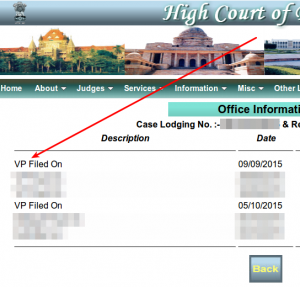 Most courts use the term VP Filed in their Roznama or online records, to indicate that the Vakalatnama was filed. Sometimes even “SV filed” is mentioned in the Roznama. SV means: Signed Vakalatnama. What does the Vakalatnama contain? 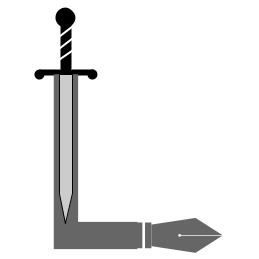 The date on which it is executed. A vakalatnama gives a lot of authority to the pleader. It should be executed by the client with great care and scrutiny. Clauses like compromising the matter, appointing another Legal Practitioner, accepting money etc. may sometimes be detrimental to the interest of the client. Who is authorised to give a Vakalatnama? (b) persons carrying on trade or business for and in the names of parties not resident within the local limits of the jurisdiction of the Court within which limits the appearance, application or acts made or done, in matters connected with such trade or business only, where no other agent is expressly authorized to make and do such appearances, applications and acts. A vakalatnama can be given jointly by multiple parties in the case, to appoint the same pleader or set of pleaders. Whom is the Vakalatnama given to? The vakalatnama can be given to one or many advocates / pleaders. Each of their names must be specifically mentioned. What is done after the Vakalatnama is given? After the Vakalatnama is given, it is filed in court within the prescribed period. (2) Every such appointment shall be filed in Court and shall, for the purposes of sub-rule (1), be deemed to be in force until determined with the leave of the court by a writing signed by the client or the pleader, as the case may tie, and filed in Court or until the client or the pleader dies, or until all proceedings in.the suit are ended so far as regards the client. Is the Vakalatnama a Power of Attorney? Yes. For all practical purposes, the Vakalatnama is a Power of Attorney. Does a Vakalatnama need to be stamped? Yes.Advocates Welfare Fund Stamps need to be affixed to the Vakalatnama. b. ten rupees on every Vakalatnama filed by him in a tribunal or other authority or a High Court or the Supreme Court: Provided that the appropriate Government may prescribe the value of the stamps not exceeding twenty-five rupees to be affixed under this sub-section: Provided further that the appropriate Government may prescribe different value of the stamps to be affixed on every Vakalatnama to be filed in a District Court, or a court subordinate to the District Court or a tribunal or other authority or a High Court or the Supreme Court. 2. The value of the stamp shall neither be the cost in a case nor be collected in any event from the client. 3. Any contravention of the provisions of sub-section (1) or sub-section (2) by any advocate shall disentitle him either in whole or in part to the benefits of the Fund and the Trustee Committee shall report such contravention to the State Bar Council for appropriate action. 4. Every stamp affixed on every Vakalatnama filed before a District Court or a court subordinate to the District Court or a tribunal or other authority or a High Court or the Supreme Court shall be cancelled in such manner as may be prescribed. Is the Vakalatnama different for different Courts? No. Since the vakalatnama has no specific form, if it contains all the required details, it can be used in any court. What is a Vakalatnama called in other languages or countries? Vakalatnama is also interchangably called vakkalathu, vakil patra, mukhtyarnama. What is the duration of the effect of the Vakalatnama? Can a Vakalatnama be withdrawn? (2) Every such appointment shall be filed in Court and shall, for the purposes of sub-rule (1), be deemed to be in force until determined with the leave of the court by a writing signed by the client or the pleader, as the case may be, and filed in Court or until the client or the pleader dies, or until all proceedings in.the suit are ended so far as regards the client. A party who wishes to discharge the Advocate engaged by him may apply to the Court for an order of discharge by following a similar procedure and the Court, if it is satisfied, may pass orders discharging the Advocate and while doing so impose such terms and conditions as it may deem proper. Can a client argue the case in person even if he has given a Vakalatnama to a lawyer / pleader? Provided that any such appearance shall, if the court so directs, be made by the party in person. Can a lawyer who has been given a Vakalatnama, appoint another lawyer to plead the case in the same or different court? Yes – If there is a specific clause in the Vakalatnama allowing him to do so. Whether an advocate-or a pleader to whom a Vakalatnama is given, has power in the absence of express authorisation to compromise the suit on behalf of the party for whom he appears. This entry was posted in Bar Council, City Civil Court, Code of Civil Procedure 1908 (CPC), Legal Terms and Phrases, Useful Information on April 26, 2013 by admin. This entry was posted in Courts in Mumbai, Useful Information on May 25, 2012 by admin. 23-A. Vacation of High Court :- (1) Every High Court shall have a vacation or vacations for such period or periods as may, from time to time, be fixed by the President, by order notified in this behalf in the Official Gazette, and every such order shall have effect notwithstanding anything contained in any other law, rule or order regulating the vacation of the High Court. When and for how long are courts closed for the vacations? 29. Vacations :- The vacations to be observed in the High Court and its Offices on the Original Side shall be three in every year, viz., the May, October and December. Vacations and shall begin and end on such days as the Court may direct. What should one do if they need to urgently file a suit or plaint during the vacation of the court? 31. Applications in vacation and on holidays: – Whenever any application is to be made to the Court in the vacation or on a holiday, the party or his Advocate on record shall give reasonable notice thereof to the Prothonotary and Senior Master or the officer whose duty it is to attend to such application. 31-A. Matters to be dealt with by a Single Judge during Vacations and Holidays :- Notwithstanding anything contained in these rules, a Single Judge may, during vacation or on holidays or when Courts are not in session, grant ad-interim Orders in any urgent matter, civil or constitutional, Original or Appellate, even when ordinarily such orders are required to be passed by a Division Bench, Such ad-interim Orders shall be placed before the appropriate Division Bench for further considerations as soon as possible on re-opening of the Court. If you need to file a suit urgently then you or your advocate may file your papers specifying the urgency in detail, in the Court Office before 11.30 a.m. every day except Saturdays and Sundays, If any urgent applications are to be made on Saturdays and Sundays, then the concerned Court Associate must be contacted at his/her residence. What is the procedure for filing a suit or plaint during the vacation? Can The Orders Uploaded On The Official Website Of The High Court Be Considered Certified Copies? What is the Index II or Index 2 / सूची क्र. २ Document? Can I use the Red Cross Symbol or Logo? When can the Red Cross symbol or logo be used? The information on this site is not a substitute for legal advice. It is only for academic value. If you find any errors or mistakes on the site, please bring them to our notice by emailing [email protected] If you wish to contribute to our website content or give your inputs, please send us an email. error: The content on this website is (C) Lawgic.info. Ask for permission at [email protected] ! !